Cream cheese and milk add to the creamy texture of this delicious Potato-Leek Soup. 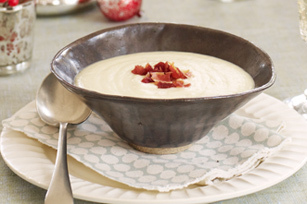 Don't forget the crumbled bacon - it's the perfect topper for this classic soup. Heat oil in Dutch oven on medium heat. Add leeks; cook 5 min. or until tender, stirring occasionally. Add potatoes, water and pepper; cover. Bring to boil; simmer on medium-low heat 15 to 20 min. or until potatoes are tender. Cool 10 min. Blend leek mixture, in batches, in blender until smooth. Return to pan. Add cream cheese product, a tablespoonful at a time; cook on medium heat until completely melted and mixture is well blended, stirring constantly. Add milk; cook 2 to 3 min. or until heated through, stirring occasionally. Top with bacon. To quickly clean your blender, fill the container half full with hot water. Add a few drops of liquid dish soap. Blend on high speed 30 sec. Pour wash water out, then rinse with fresh hot water.